Main oppostion party, Congress on Friday slammed Narendra Modi government on FDI in retail, saying it had earlier opposed the move but now was considering relaxing the norms and also bringing in FDI in single-brand retail under the automatic route at a time when private investment was the lowest in 25 years. The party also hoped that Modi will move beyond rhetoric to ensure growth in investment climate in India. "Prime Minister Narendra Modi chaired a meeting to review India's FDI policy amidst news reports that government is considering relaxing FDI norms in retail and also bring FDI in single-brand retail under the automatic route," said Congress spokesperson Randeep Singh Surjewala. "Congress wants to remind that UPA government took a series of steps to liberalise the economy, including permitting 51 per cent FDI in multi-brand retail without hurting the Indian producers, small scale industries or the wholesale or retail trade and even restricted this to major metropolitan cities." He noted that it was BJP which "virulently opposed the FDI in retail". "On September 14, 2012, Modi opposed FDI in retail stating 'it would immensely harm small shopkeepers, hit the domestic manufacturers and create joblessness. It would also mean that cheap goods produced outside will be dumped into our nation'. 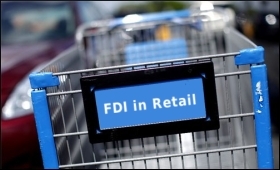 "On December 2, 2012, BJP moved a motion in Lok Sabha opposing 51 per cent FDI in multi-brand retail, which was defeated. On March 7, 2013, the then Leader of Opposition of BJP and present Finance Minister Arun Jaitley stated that BJP will fight FDI in retail 'till the last breath'," he added. Surjewala also said: "We have seen a lot of talk on investment, but minimum results in three years of the BJP government. No wonder that over 71 FDI proposals running into a few billion dollars are pending since 2015. "This speaks volume about ease of doing business. What is even more shocking is that private investment is the lowest in last 25 years. We hope that the Prime Minister will move beyond rhetoric to ensure growth in investment climate in India."